It includes a Rubik's cube, a computer mouse, and a six-pack of beer. The year was 1983. A group of tech geeks were attending a conference in Aspen: the International Design Conference. They wanted to commemorate the occasion; they wanted to commemorate the year. So they did what any group of preemptively nostalgic nerds would do: They created a time capsule. Specifically, they created a collection of mementos -- artifacts that represented the moment they were living -- and put them in a large tube. 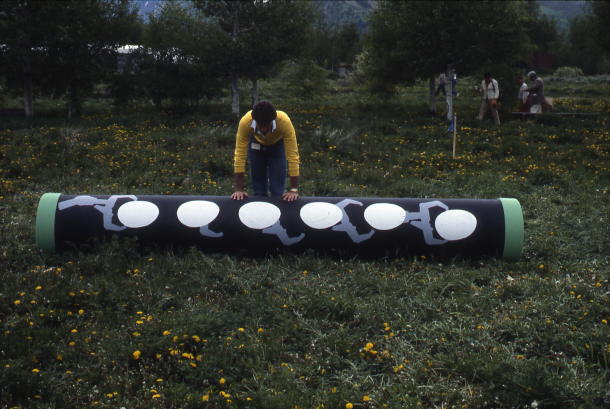 They named the resulting archive, officially and rather awesomely, the Aspen Time Tube. So if your goal is to curate a collection of culturally representative mementos, and if your further goal is to make those mementos representative of 1983 ... what would you include? A Rubik's cube, for one thing. And a Moody Blues recording. And name tags from the conference. Oh, and also: a mouse used for a presentation given by conference attendee Steve Jobs. A mouse used specifically with the early Lisa computer -- and used to give a presentation that some say foreshadowed wireless networking and the iPad. For that reason, the detritus-of-1983-filled tube quickly became known, its official name notwithstanding, as the "Steve Jobs Time Capsule." The group that had created it buried the tube. Their plan was to unearth their time capsule in a year that seemed appropriately epic: 2000. They encountered a problem, however, that will be familiar to many would-be time capsule digger-uppers: The area where they buried the time capsule evolved in the 17 years that followed its interment. The group had marked the location, but the location had been re-landscaped significantly between 1983 and 2000 -- changed enough, alas, to make it hard to find the tube when the time came. "And so," as CNET puts it, "for 30 years, the Steve Jobs Time Capsule was hidden underground, unavailable to the many historians eager to see what was inside." That just changed. Because of cable TV. The National Geographic Channel has a show called Diggers. Which involves ... well, it's pretty self-explanatory. The show's team decided to take on the task of finding this buried treasure from the early '80s, and, yesterday, they hit gold: gold in the form of a 13-foot tube. Gold in the form of a time capsule. They had -- 13 years late being much better than never -- unearthed the Steve Jobs Time Capsule. The capsule, it turns out, was decidedly un-Jobsian in one way: It was cluttered. It was packed full of objects -- to the extent that it will take some time before the crew can excavate the tube they've just excavated. "When the end came off," Diggers co-host Tim Saylor told CNET, "literally things just poured out. There must be literally thousands of things in there." There is, however, one '80s artifact the team has already removed from the capsule, though: a six-pack of beer. Balantine, to be exact. Which was there to serve not necessarily as archival evidence of a time gone by, but as a refreshing beverage for whoever ended up unearthing the tube. As Harry Teague, president of the 1983 conference, recalled of the logic that informed that particular design decision: "The guys that dig this up will be sweaty and appreciate a six-pack."